September 2018 – Pretty Things, Nice Life! The heat index was in the triple digits yesterday…so much for autumn and pumpkin spice lattes. Lyrium released another 1L freebie and I couldn’t resist showing it off. There are a lot of great poses in the Marketplace that are great for new bloggers looking to build a pose collection. You can find many that are either free or under 5L. This bench, which I love, is by PILOT and was available on a Fifty Linden Friday a few months back. I had just started blogging and thought that will look great in a picture and I was happy to set it free from my inventory for a bit while I took this photo. I’m sure fall is lurking just around the corner but until she decides to show up again, I’ll stay right here. I’m so excited about the Pose Fair coming soon! I can’t tell you how many times a pose has given me the idea for a photo versus having an idea for a photo and trying to find a pose to match. I love when it happens that way and this latest pose by PosEd Poses did exactly that. I knew how I wanted to use it as soon as I saw it. It is called Fall for You and includes a scattered leaf prop that is easily hidden based on whatever works for your photo. It is one of five new poses by PosEd Poses that will debut at the Pose Fair which starts on October 1st! I can’t wait to be inspired! There is something about a sun filled room that can sooth the soul. I can just feel the warmth in this room, welcoming all who enter. Please, come sit and rest your weary eyes, join the cat in a nap and enjoy your day and/or evening…wherever you may be. So this may not be what you were expecting by the title but if you are a busy parent, caregiver or have been with your significant other for quite some time, this may be your idea of a perfect date night. I love my alone time when I am free to do whatever I want, when I want and how I want. Sometimes that is sitting in a swing and reading and sometimes its curled up in bed with popcorn and a good scary movie. This beautiful lily pond by Krescendo is a perfect addition to any outdoor space. It has seating for singles, cuddles for couples and includes a hud with options to change textures of all parts; the wood, water, duckweed and the lily pads. The Lily Pond can be found at the current round of Cosmopolitan. “Cheveux on the rocks please.” It sounds like you are ordering a drink but in reality…well, make that virtual reality, it is a great new hair by Cheveux available at the Hair Fair. The Hair Fair starts September 22nd and if you are in the demo group you get access to all the demos today, September 21st. The sim design is great this year with sort of an “out west” feel about it with cute little clusters of cactus scattered about. You can also hop on a prim bus again this year, to help you move around the sim. Most importantly, this is a fundraising event for Wigs for Kids. You can read all about the important work they do here. 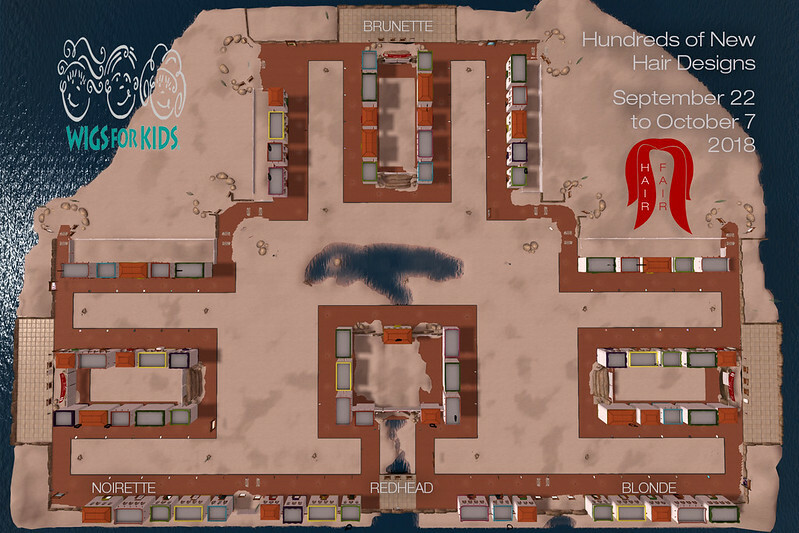 The Hair Fair runs thru October 7th so be sure to visit the sims, get some new hair and donate to a great cause.